Alzheimer’s disease (AD) is an irreversible, progressive brain disease that slowly destroys memory and thinking skills and, eventually, the ability to carry out the simplest tasks of daily living. Although treatment can help manage the symptoms of AD, there is no cure for the disease. The Alzheimer’s Association estimates that more five million people are currently living with the disease. AD is but one of many forms of dementia or progressive cognitive impairment. In AD, there is abnormal build-up of two proteins, amyloid and tau. Amyloid accumulates as plaques and tau as neurofibrillary tangles. Abnormal build-up of these proteins causes the neurons to work less efficiently. There is progressive damage to the neurons and connections between neurons, leading eventually to neuronal death. This process gradually spreads to the brain’s learning and memory center, the hippocampus, and then to other areas of the brain. Scientists believe these brain changes begin 10-20 years before the signs or symptoms of the disease appear. Common brain imaging techniques such as computed tomography (CT) and magnetic resonance imaging (MRI) scans cannot see amyloid plaques and neurofibrillary tangles. Molecular imaging provides the unique opportunity to visualize each of these characteristic features of Alzheimer's disease. Molecular imaging is a type of medical imaging that provides detailed pictures of what is happening inside the body at the molecular and cellular level. While other kinds of diagnostic imaging procedures, such as x-rays, computed tomography (CT) and ultrasound create anatomical pictures, molecular imaging allows physicians to see physiology and function. Molecular imaging excels at detecting the small, cellular changes that occur early in the course of disease, often well before structural changes can be seen on CT and MR images. Molecular imaging can detect abnormalities in the brain months or years before the structural changes might occur. Most molecular imaging procedures involve an imaging device and an imaging agent, or probe. A variety of imaging agents are used to visualize cellular activity, such as the chemical processes involved in metabolism, oxygen use or blood flow. In nuclear medicine, which is a branch of molecular imaging, the imaging agent is a radiotracer, a compound that includes a radioactive atom, or isotope. Other molecular imaging modalities, such as optical imaging and molecular ultrasound, use a variety of different agents. Magnetic resonance spectroscopy is able to measure certain chemical levels in the body, without the use of an imaging agent. What molecular imaging technologies are used for Alzheimer’s disease? Diagnosis of AD is currently a complex process that may include a detailed patient history, physical and neurological exams, laboratory tests and a lengthy process of excluding other possible causes of mental decline. Clinical diagnosis of AD has an accuracy of only 63% and tests, such as Draw a Clock, only become positive late in the disease process when little can be done to treat AD (Henderson, 2012). While a definitive diagnosis of AD is still only possible by autopsy following a patient's death, new diagnostic criteria from the Alzheimer's Association emphasize the importance of biomarkers, such as molecular neuroimaging. Researchers are exploring how improved quantitative analysis and new molecular markers can help physicians diagnose AD earlier and more accurately. This, in turn, could improve patient management and outcomes. Positron emission tomography (PET) involves the use of an imaging device (PET scanner) and a radiotracer that is injected into the patient’s bloodstream. A frequently used PET radiotracer in evaluating dementia is 18F-fluorodeoxyglucose (FDG), a compound derived from a simple sugar and a small amount of radioactive fluorine. More active brain cells accumulate more FDG tracer. The diagnostic accuracy of FDG PET scans for AD is 93% (Bohnen et. al., 2012). FDG PET also allows the differentiation of AD from other forms of dementia. Amyloid PET uses a radiotracer that selectively labels amyloid plaques, which accumulate in AD (Johnson et. al, 2013). 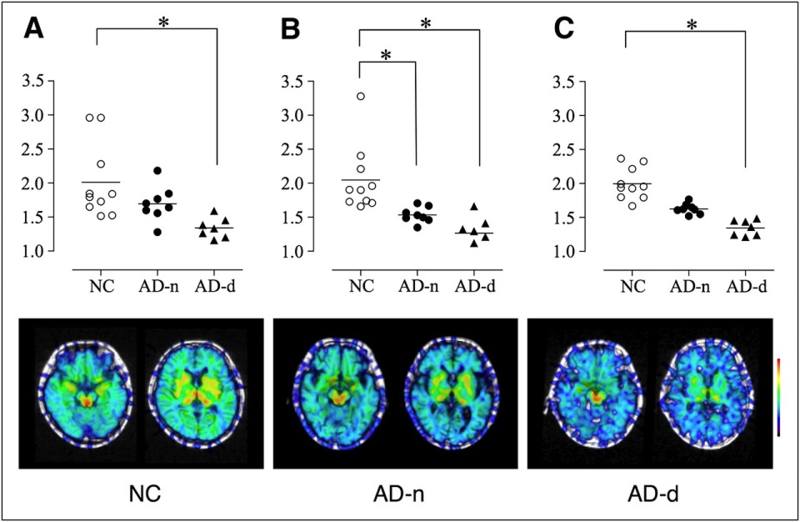 Below age 60, a positive amyloid PET is highly predictive of AD. A negative amyloid PET in a patient with dementia symptoms is highly predictive of some other form of dementia. However, over the age of 60, there may be a 20% or more false positive rate (Henderson, 2012; Johnson et. al, 2013). Therefore, the information from imaging should always be interpreted in conjunction with other testing and clinical assessment. Regardless of the PET tracer used, once the radiotracer accumulates in the brain, it's natural decay eventually produces photons, small packets of light energy. The PET scanner is able to detect these photons and uses them to create three-dimensional images that show where the radiotracer is distributed in the body. Single photon emission tomography (SPECT) involves the use of an imaging device (SPECT scanner) and a radiotracer that is injected into the patient's bloodstream. In perfusion SPECT imaging, the tracer accumulates in cells based on how much blood flow they receive. Since blood flow is correlate of activity in the brain, SPECT show areas of increased and decreased brain activity. Perfusion SPECT can demonstrate decreases of function in the temporal lobes, parietal lobes, and postural cingulate gyrus, consistent with AD and provides a reliable means of separating AD from other types of dementia. Regardless of the SPECT tracer used, once the radiotracer accumulates in the brain, it's natural decay eventually produces gamma photons. The SPECT scanner, which is able to detect these gamma photons, creates three-dimensional images that show how the radiotracer is distributed in the brain. PET and SPECT scanners are often combined with CT that produces detailed views of the anatomy. The combination of two imaging techniques-called co-registration, fusion imaging or hybrid imaging-allows information from two different kinds of scans to be viewed in a single set of images. CT imaging uses advances x-ray equipment and in some cases contrast-enhancing material to produce three-dimensional images. How is PET and SPECT performed? The procedure begins with an intravenous (IV) injection of a radiotracer. Then time is allowed for the tracer to distribute throughout the body. In the case of FDG, this can be between 30 and 60 minutes. In the case of perfusion SPECT, the tracer captures the image of the brain function in 40 minutes. The patient is then placed in the scanner where detectors are used to create a three-dimensional image of the tracer distribution. How is molecular neuroimaging used for Alzheimer’s disease? What are the advantages of PET for the brain? PET allows metabolic activity to be directly visualized, not inferred. PET studies allow abnormal brain function to be detected before structural changes resulting from brain cell death can be seen on CT or MRI. PET is highly useful in detecting specific types of dementia, such as Alzheimer's disease and frontotemporal dementia. In these disorders, early brain damage may not impact brain volume or structure that is identifiable on CT or MR.
Insurance companies will cover the cost of some PET scans. PET scans that measure brain amyloid plaques are covered if part of a clinical trial. Check with your insurance company for specific information on your plan. Not all procedures described herein are covered by every insurance plan.